Everything moved out of MOVE’s previous Yates St. location. We are so proud to be celebrating our 10 year anniversary with the opening of our new location this year! We have the support of so many individuals, organizations, and the community of Victoria to thank for contributing to the continued growth of MOVE Adapted Fitness and Rehabilitation Society. MOVE has gone through many changes over the years in an effort to best support our members. 2007 - Dennis Rogers opened a facility named P.A.T.H. Spinal Cord Injury Group, which was a centre for adapted exercise with specialized equipment. Thanks to David Char, an affordable space was provided on Johnson Street. The need for a space that facilitated exercise for individuals with physical disabilities was beginning to be realized. P.A.T.H.’s mission and vision was to provide affordable access to a space for those with disabilities to engage in physical activity. PHASE 1 was born. 2009 - With the help and support of Dennis Rogers, our first Board of Directors (Ian Brown, Jim McPherson, Loraine Noel, Gerald Umphrey, Joanne Rogers) took a leap of faith and stepped up to launch Friends of P.A.T.H Spinal Cord Injury Group Society. 2013/14 - A meeting with Hillary Acosta brought us to Neuromotion and Pauline Martin. 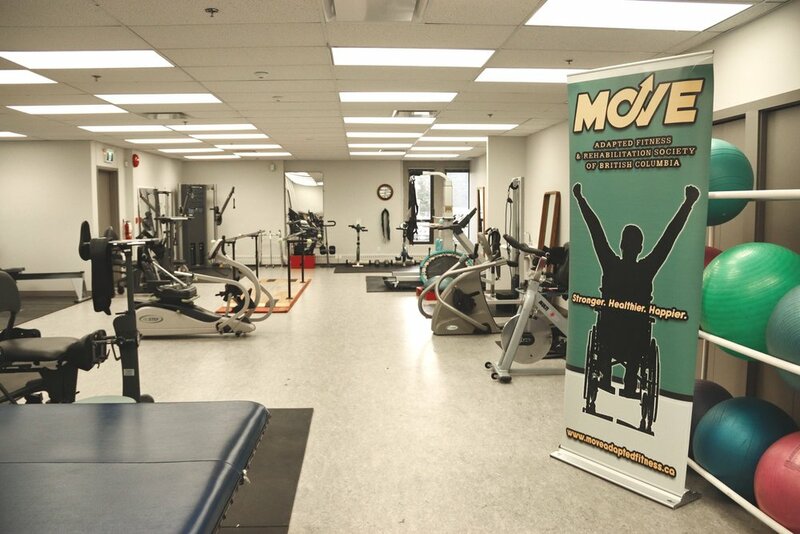 This led to a new beginning, direction, and change of name to MOVE Adapted Fitness and Rehabilitation Society of B.C. Dr. Melvin DeLevie and his son Adam provided us with a new space at 531 Yates Street and so much support throughout the years. With the rebranding, a new Board of Directors was formed (Adam DeLevie, Hillary Acosta, Owen Madrick, Brenda Moar, Alistair Green, John Hopper, John Buchan, Kabir Baburi, Ian Thornton, Joanne Rogers, Robin Unger, and Chris Marks). 2014-2018 - Joan Athey was introduced to MOVE, and has been a valued constant in all our fundraising efforts, which have been critical to the continued expansion of MOVE. It was during this phase the MOVE launched our Volunteer Staffing Program. This program brought students from Camosun College and University of Victoria to MOVE’s door. The program provides volunteer support for MOVE members while simultaneously providing students with hands-on experience working with clients. MOVE expanded again when the MS Society donated their adapted equipment, and many members joined the MOVE community. Alannah, MOVE’s Facilities Coordinator, visiting our new location during the construction phase. 2019 - In 2018 it became apparent that MOVE was quickly outgrowing our space on Yates St. Our current Board of Directors (Jacqueline Van Alstyne, Gwendolen O’Connor, Hillary Acosta, Kabir Baburi, Craig McKinnon, Patrick Dudding, Jeanine Reemst, Carmelina Piemontesi, and Joanne Rogers) discussed solutions for months. Pauline Martin, Hillary Acosta, and Jacqueline Van Alstyne of Neuromotion, along with their staff, have been mentors, teachers, and friends to all of the staff and clients of MOVE. Therefore, with Neuromotion Centre for Rehabilitation planning to open in April, the board came to the conclusion moving locations and joining the multidisciplinary centre was the best path for MOVE. MOVE will be opening our doors in our new location at 100-775 Topaz Avenue on April 15, 2019. Along with MOVE, the Neuromotion Centre for Rehabilitation will house Neuromotion Physiotherapy and Rehabilitation which includes a multidisciplinary team of physiotherapists, occupational therapists, athletic therapists, kinesiologists, speech language pathologists, and a music therapist. The centre will also include Ability Orthotics, Aud-Ability, and Dr. Jacqueline Pierce (Physical Medicine, Rehabilitation & Electromyography). Phase 3 is another new beginning of growth and continued expansion of our our ability to reach more people in need of our expertise in adapted exercise. To have reached this 10 year mark and to be able to be part of a centre dedicated to mobility, physical activity, and rehabilitation is the culmination of MOVE’s vision and mission. Our deepest gratitude to everyone that has generously given their time, effort, and financial support to allow for MOVE to continue to serve our community. We look forward to seeing you in our new space! Newer PostCTV news - "New neurology rehab clinic opens in Victoria"